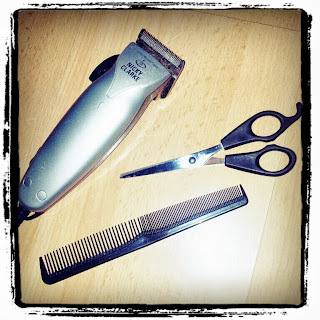 Recently I spoke about facing my fear - of the hairdresser. What I forget to mention was Mini's fear of hair cutting too, and it's only this afternoon's antics that have reminded me! You see, when Mini came to us, he had relatively long hair for a little one. We cut it quite soon into his placement here into quite a short style, and it stayed pretty much that way until the end of reception year at school! And when I say 'we' cut it, I mean me and occasionally the NC - I cut the NC's hair too, with my trusty clippers. Over the years it's become harder and harder for Mini to have us cut his hair. He absolutely will not let his father do it these days. To begin with the noise was an issue, however a spot of CBeebies was enough to distract, but over time he's given other reasons for avoiding a trim...he's scared we'll clip his ears off, he doesn't like the cape he has to wear, the chair is too hard, it hurts, he's got something else to do first, and almost always the itchiness (of the little bits of hair that irritate his neck). We've tried all sorts to help him with this fear, often it's been easier to just drop it and try again another day - we really do have to pick our battles, even though doing this has often attracted comments about his messy, unruly, long, girly hair. We even had an unkind comment where someone asked me which of my children was my daughter, because from the back his hair was so long it was hard to tell. It came to a head (boom boom!) at the end of reception year at school, when we'd had so many battles I agreed that Mini could grow his hair over the summer as long as he let us cut it in September. When September came around his longer style really suited him and so we let him keep it a bit longer...and a bit longer. Then it got too long (and not just by my standards, but it was irritating Mini - in his eyes particularly), but long hair is beyond my capabilities with the clippers, and really a proper scissor cut was needed. After about 6 weeks, 2 attempts resulting in meltdowns, and a bit of good old fashioned bribery we got him to a proper barbers, and the hair was trimmed. I can't remember exactly what prompted the full on clip again, or whether it was just before or just after the return to school this year, but Mini requested a proper short-haired 'do' again and so I returned to clipping duty. Whatever it was, it was that long ago that over the last ten days or so, it's been in need of another trim. Too long to spike up for school, so long that daily bed-head occurred. So after warning Mini this morning - a particularly unruly bed-head day- that today was clipping day, we returned home after school and I fetched the torturous tool! Cue one full-on, screaming, body flinging, weeing at will, tearful meltdown. Ah yes, that was the reason we avoided hair cuts! But, I'm pleased with myself and pleased with Mini because it's only taken an hour to calm him, talk to him, cut his hair, calm him again, bathe him, dress him and hug him :-) Yes a whole hour, but that's about an hour shorter than previous battles...which often resulted in us giving up anyway! And he looks bloody gorgeous now I can see his whole face properly again! So well done Mini, and thank you for letting me calm you, hug you and tidy you up! 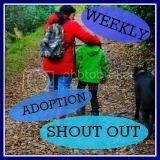 Yes it was a battle, but it was also an achievement, so I'm linking up with MemoryBox on The Adoption Social. Hair cuts for little ones can be emotional for us and testing for them. I usually take my son to have his cute I'm too afraid to get it wrong. Well done you!